Finding an esthetician I really love in our new neighborhood has honestly been a huge challenge for me. While I have tried a few in the area, I haven’t found one that I connect with on a personal level, and one that delivers quality services at reasonable prices. Not only do frequent facials add up quickly, sometimes the idea of having to brave the heat for a while in the car as I make my way to an esthetician deters me. First world problems for someone living in the desert… I know! With that said, I have been extra proactive with home care when it comes to my face and neck. As I approach my 30’s, it has become super important for me to take all the preventative measures I can to halt the aging process. This involves staying consistent with a solid routine, and using quality products. 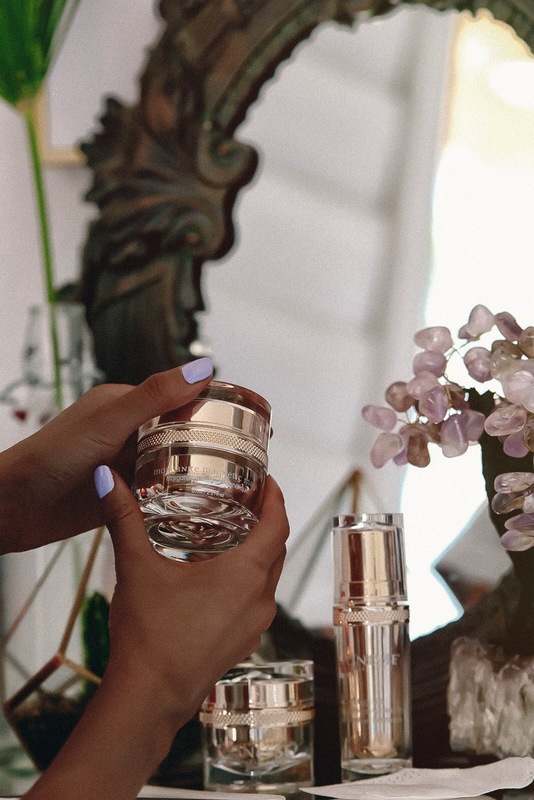 Today, I’ll be sharing more about Lionesse Gem Skin Care’s Morganite Collection, which has been a pivotal part of my home care routine at night, helping me achieve balance and a healthy glow! 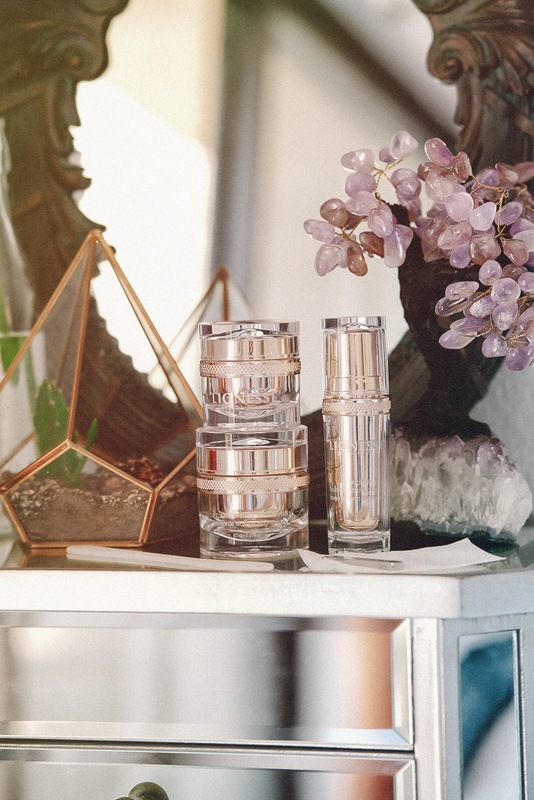 Lionesse Gem Skin Care’s Morganite Collection consists of 3 game-changer products that I swear by: a magnetic mask, a transforming serum, and a reinforcing cream. I use these in this exact order at night before I go to sleep! Those of you who know me know that I love being outdoors soaking in my daily dose Vitamin D whenever I can. Even though I use sunscreen religiously, the UV rays out here are definitely much stronger than in other places where the sun shines brightly. So, it is necessary for me to follow with a solid nightly routine to heal and refresh my skin after repeated sun exposure. Perfectly bronzed skin is a major pro, but not when it’s dry, wrinkly, and dull-looking! Face masks are something I have gotten into consistently only recently. The right ones address many skin concerns, and hydrate the skin while removing excess oils. Sometimes when my skin feels dirty, I find that masks do a wonderful job at pulling out impurities and improving the appearance of my pores. When I was just starting out, I was very loyal to sheet masks because they are readily available and cost-efficient. But, I didn’t always use them consistently because I felt they were sort of messy and overall not as pleasant to use. 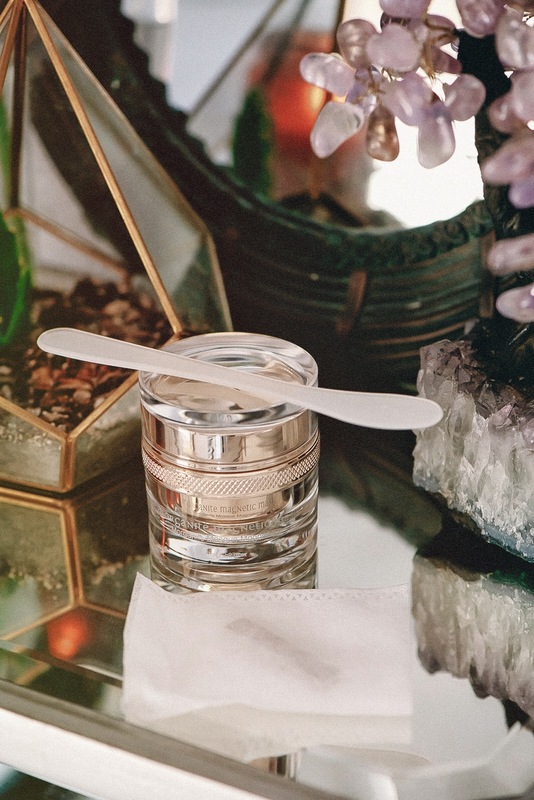 The Morganite Magnetic Mask is the first magnetic mask I have ever tried in my life – and I have to say that it is pretty cool! It has definitely changed the way I feel about and look at masks. I don’t quite know how to put my amazing experience into words, except that it literally feels like I am magnetizing the energy back into my fatigued skin. Yes, the harsh humid weather these days have not been friendly to my face. I find myself looking dull and tired more often than ever. This luxurious mask definitely helps to nourish my skin with healthy oils and botanicals, restoring that glow that I always long for! I’m a firm believer that when you look your best, you also feel your best. Even though it looks intimidating at first, using this is much simpler than I anticipated. When I opened the box, I couldn’t quite figure out what the magnet and sachef was for. After reading the instructions though, I was able to figure it out. Before applying any product, I always make sure to cleanse my face with my go-to cleanser. Then, I gently pat my face dry and apply the mask evenly onto my freshly cleansed and damp skin. Like with any mask, I leave this on for 10-15 minutes before removing it. The removal process is what really intrigues me! I simply hover the enclosed magnet close to my skin to remove it. It’s like ma-aaaaa-gic! Unlike traditional masks, this one is not messy and feels very rejuvenating. For optimal results, I have been using this 3 times a week. The mask is gentle enough for everyday use as well, but sometimes I find it hard to make time for a mask everyday. 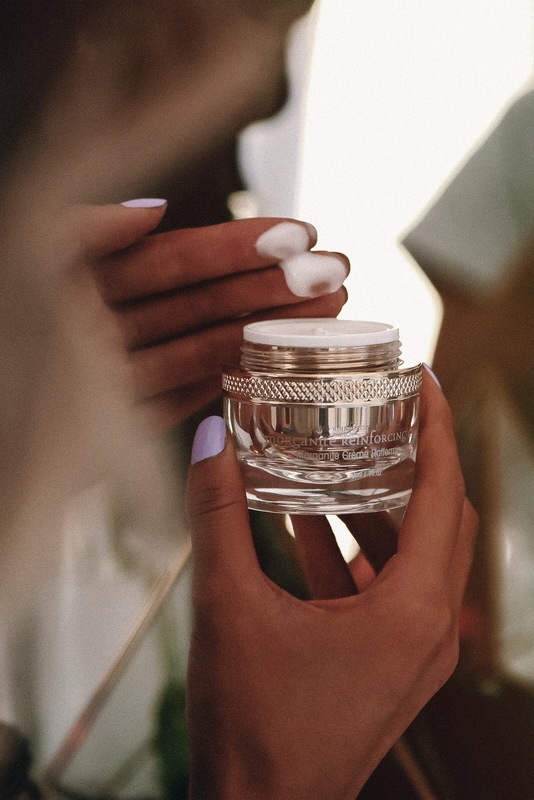 After mask time, I always follow with a face serum for best results. Just a year ago, I never really quite understood the importance of serum – it always felt redundant to me because it almost felt like a lightweight moisturizer. I know there are many of you that might be thinking the same way. Recently, I learned that serums are actually a very essential part of skin care. They penetrate deep into the skin so that you are able to truly take advantage of all the nutrients in whatever you use, such as masks and moisturizers. It also helps to shrink pores, giving the appearance of visibly firmer and smoother skin. I have used many serums in the past, but none have come close to the Morganite Transforming Serum in terms of quality and delivery. It features a silky texture and is infused with a plethora of powerful ingredients that work overnight to deliver a soft, more youthful appearance the next morning. I am definitely more motivated when I get instant gratification, and love that this serum makes me feel and look younger right away. As far as application goes, it is fairly simple. On clean and damp skin, I massage it liberally into my face and neck areas until fully absorbed. This magic-in-a-bottle is extremely lightweight and does not leave behind any heavy residue. I know many people who use a ton of products on their face especially at night, but I prefer to keep it as simple as I can. Quantity is not always quality, ladies! In fact, from my personal experience, keeping it limited to a few really good products is all I need to achieve beautiful skin. An excellent moisturizer has always been a staple in my beauty routine though. As most of you know, a suitable moisturizer works wonders in treating dry skin, and protecting sensitive skin. If you have oily skin, it is still important to use a moisturizer – one that is formulated to address it. Moisturizers hold water in the outermost layer of the skin, and also acts as a temporary barrier against impurities that may cause irritation. After using serum, I finish off with the Morganite Reinforcing Cream and then apply my usual eye cream before going to bed. 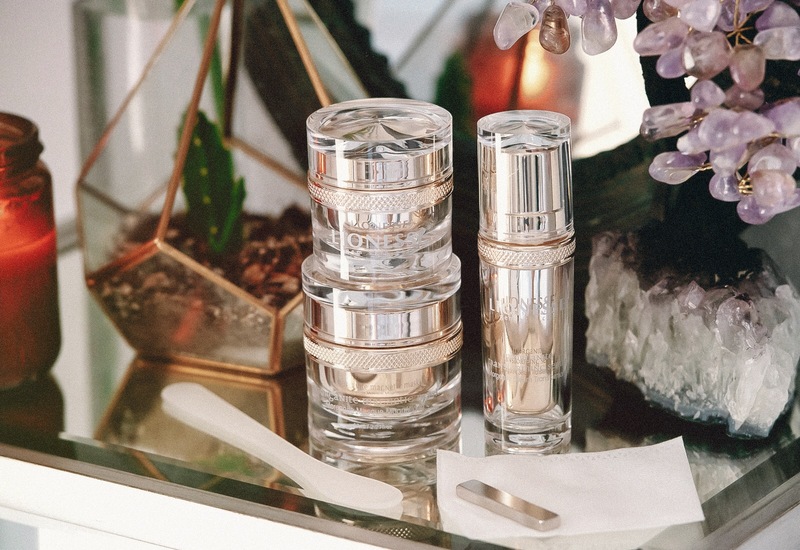 This anti-aging gem works best in conjunction with the transforming serum for full renewing benefits, but can also be used on its own as a moisturizer for dry and dehydrated skin. Similar to the serum, I use this cream every night, massaging it well into my face and neck. Even though the cream feels rich, it does not leave me feeling gross after it is fully absorbed. Waking up the next morning, my skin feels much stronger, firmer, and healthier! [bigletter custom_class=””]As far as eye cream goes, I am dying to try Lionesse Gem Skin Care’s Amber Collection. It features a bunch of products that are formulated with Vitamin A, Vitamin E, and caffeine to obviously target the delicate eye areas. These ingredients work to address concerns like dark circles, puffiness, and wrinkles, to name a few. With repeated use, the creams and serum are supposed to deliver a brighter, well-rested look. For now, I’m just using La Mer’s Eye Concentrate as the final step of my nightly beauty routine. Once I run out of it, I will be investing in the Amber collection to see how I like it! Since I am a fan of the Morganite Collection, I have high hopes that the Amber collection will work wonderfully too. These days, I have been placing extra efforts in prioritizing self-care in my everyday life. As an overworked entrepreneur, sometimes it is easy to neglect your health and well-being. But, taking small strides have made a substantial impact for me. One of these baby steps include upping my nightly beauty routine game with Lionesse Gem Skin Care’s Morganite Collection. My skin has never felt so revitalized, especially now going months without seeing an esthetician! I love being able to treat myself to a mini spa session every night before going to bed. The best part is, I can do it all from the comfort of my own bathroom. Even though the collection (and the individual products if you choose buy them separately) comes with a hefty price tag, I find it worth the splurge because I don’t have to leave the house to achieve glowing skin! Plus, a little bit of product goes a long way with these, so I feel that they will last me quite a while before I have to stock up again. What are some of your favorite products for at-home skin care that you enjoy using at night before going to bed? Wow, Lioness Gem Skin Care sounds like a very luxurious line! I would love to try the Morganite collection myself seeing how perfect your skin is. I’ll look into it and maybe ask my husband to get it for me for my birthday. Thank you for sharing. The packaging is just WOW! So beautiful. It’s good to know that their products are also worth the money and work well for you! It’s my first time hearing about Lionesse but I took a quick look at their website and looks like they have a good variety of products to offer. I may just have to get the eye cream from the Amber collection since my current one is running out! Aw yay! So glad I was able to introduce a new brand to you 🙂 They definitely have a great variety of collections and each targeting different skin care needs! Would love to hear your thoughts on the eye cream from the Amber Collection! Man I’ve been looking at their products in the past, looks pretty great might put it on my holiday wish list! Haha now that you mention it, the holidays really aren’t too far off! Beautiful products and such an interesting combo of ingredients! Ooh this new mask sounds fab! i love it! I highly recommend this one! I feel like I’m not going to want to try any other magnetic mask now that I’ve tried this one. It’s soooo good! These certainly sound like some amazing products. Who doesn’t want glowing skin? Must try these! Glowing skin is always in! Let me know how you like these if you get a chance to try em! sounds worth a try – such pretty packaging too! The pretty packaging definitely pulled me in, haha! The photography in this post is so amazing, you look stunning! Oh, I’m definitely adding this to my wishlist for my birthday! I love the packaging detail, it’s gorgeous! They sound like amazing products! I know right?! That’s what I thought too haha you should see the boxes it came in! They were pretty gold boxes but I didn’t take pictures of them hahaha. I do think that these gems brighten up my bathroom though! Wow, what a great skincare regimen system! 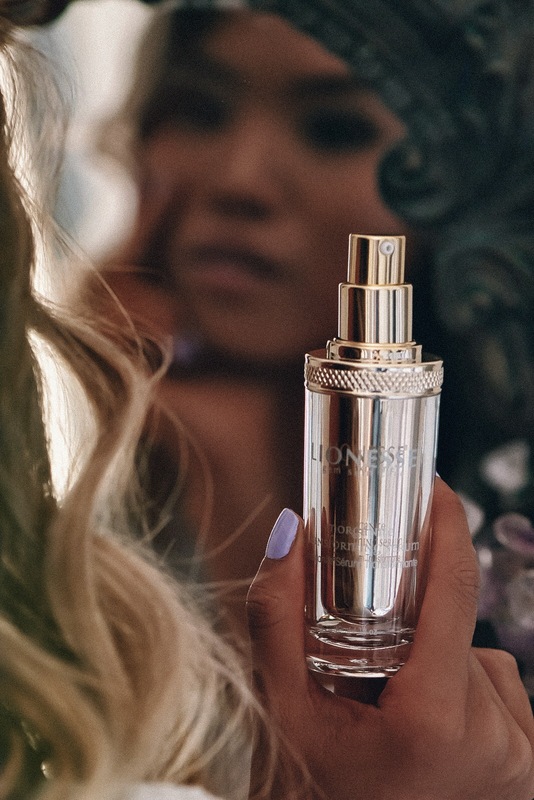 I’ll have to check out the Lionesse Gem skincare! Never heard of this product before and I can’t wait to try it out. This sounds SO luxurious. I love that! I love a good mask, this sounds luxurious! I will have to try it out! This brand looks amazing! I am all about the magnetic face mask so I will definitely have to check this brand out! This sounds so cool!!! Your skin is flawless, lady! Love the packaging on these products. These are new to me but will look into them. Thanks for sharing. My skin has been so uncooperative in this summer heat. I’ve been looking into investing in a more luxurious facer regimen. Your skin is beautiful so definitely worth a shot! Wow you skin looks amazing, I need to check out their products. Love the packaging, too. So luxurious. Thank you Rachel! I love products that have pretty packaging and work well too! Wow! Look at your skin so glowy and radiant. Looks like a skin care regimen to try. Thanks for sharing the good tricks! Girl I’m loving the new design of your blog!! So good and this collection looks amazing! So very luxe and definitely take time to look after yourself honey – it’s so important! This definitely looks like a must-try. Love the elegance of the bottle. Totally is! I love the packaging too – so beautiful! I’m following this step by step!! Sounds amazing! Hmm, I had never heard of Lionesse before reading this post. You have AMAZING skin obviously, so I’m thinking I need to check them out! I have their skincare too! You got me! I need to get this product ASAP! It looks so good! And you know i love skin products! This line sounds awesome! The packaging is really cute too. Thank you Laura! I’ve been really loving this collection. The beautiful packaging is certainly a bonus! This looks like a promising product. I would love to try it! This skincare line sounds amazing!! I am so intrigued by the magnetic mask. I’ll definitely need to give that a try. Girl your skin is flawless! I’ve been dying to try that magnetic mask, and it seems like it’s been working so well for you. Must give it a go! Thanks Bryanna! The magnetic mask is a good one to try! Sharon your skin always looks so incredible. I’ve heard of the magnetic masks and haven’t used them myself but they look so cool. It’s so good you’ve found a skincare brand that works so well for you. I have found a few myself but this is a great reminder to use masks more often since I hardly do! Thanks for sharing. I’ll need to check these out. Have a great week babe. You got me at “anti-aging”! Ooohhh! This just got bumped up to the top of my Christmas wish-list! Awesome product! Keeps my skin youthful. Would love to try this… Lionesse products are superior!!! I would love the opportunity to try your products….they’re a bit costly for my budget so winning would be awesome!!!!!! And the model is gorgeous!! I think this is an awesome offer! Thanks for telling me how great the Morganite collection is! I am using the Amber eye cream and adore it! The Lionesse Morganite line sounds like a dream come true! I’d love to be able to try any of the Lionesse products honestly, my skin most certainly could use it. Very interesting article that left me with a lot to think about. This sounds amazing and I would love to try these products. Thank you. I love it and fascinated with the ingredients! Sounds amazing and would love to try this collection. Even the bottle is beautiful!!! These products sound excellent. I am checking into them as soon as I am done here. I would love to try this. It looks like it works great. I need to try this skincare line. Wow, what a treat for tired skin. Would love to try your products. WOW, sounds like a great skincare line. The description of the magnetic mask blew me away. How unique and interesting! My face needs to be transformed. I want that Serum! Did I read correctly? You remove the mask with a magnet? Amazing!! Me and my daughter use a serum after we do our masks rather than a moisturizer because I like the serum better. I would love to win this product although I know me and my daughter or my sister would be battling for it. I had a sample of a magnetic mask done on me in the mall. It supposedly had gold particles. I did love the way my cheek felt after. But I couldn’t afford that. Just bought a different mask from same company. Lioness I been aware of for at least a couple years. Good luck everyone! I believe if the products work then they are worth every penny they cost! I would love to try some of their products! They have a ton a great product lines to target whatever you need! Thanks for the great post! An awesome luxury item I’m adding to my wish list that should prove to make my skin look uplifted and glow like the moon. I have never tried this product I would love too. My face is showing signs of old age. looks like it would do wonders for your skin and I have very sensitive skin. I think this might work for me. I am getting older now and am excited to see what these products can do for my skin. The ingredients in this line seem vey luxurious. My skin never really looked too bad but 8 months of chemo has taken it’s toll on almost every part of my body. Lioness Gem Skin Care sound luxurious and something to try. All of these products sound so wonderful. I think the mask is something that I would really like to try. It is something that my skin really needs. Looks like a great product. I really want to try. Looks awesome, would love to try! Now that I am almost 40 I am looking for some ways to keep my skin looking young! It sounds amazing and looks so luxurious!Thanks for sharing the info. This produvt sounds amazing. I like that it is magnetic. I like high quality products, and this sure is. These products sound like they really make a difference.I think if it is going to work it has to be a daily routine .Consistency is an important factor as well asthe quality of the product and of course a healthy lifestyle. I have never tried a magnetic mask. After reading this I need it with the serum. I am 69 and don’t take care of my skin like I use to. It’s dull and dry. I nerd help. This sounds like it would be absolutely amazing to try. It’s amazing. I’d love to try. This line sounds like a dream come true in skincare. This will be on my Christmas wish list!